With the growing popularity of smartphones and their almost infinite application capabilities, Dark Matter Audio gives a step beyond on this market by creating the ultimate app-system especially devoted to music production and performance. The DMA1 can be simply described as a super smartphone, the only difference is that you are not going to be able to make phone calls with it. The DMA1 lets you access app stores and easily fill it with audio production apps. The DMA1 is designed to deliver professional and high-quality audio processing, as also can be used as a digital Multitrack recorder, MP3/4 player, MIDI interface, (up to) 5.1 digital mixing desk and much more. This British-based forward-thinking company created the DMA1 to be a compact, price-accessible tool that can be used in many audio applications; be they studio or stage ones. A vocalist, bassist or guitar player can simply carry all their favorite effects in the DMA1 and just plug the instrument (or microphone) in and start playing. The versatility of not having to carry pedals, cables and heavy cases, makes the DMA1 a very practical tool. The DMA1 can also be used by studio musicians and producers for diverse applications, such as a drum machine, sampler, loop recorder, digital patch bay, video tutorial device, chord and scale matcher, database of transcribed music, lyric organizer, composition sketch tool, and whatever other application you might find on the app store. 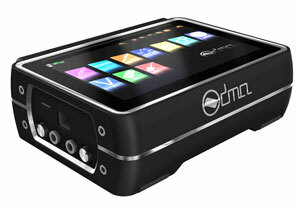 The DMA1 will be available for purchasing later in the year. Retail price has yet to be announced.